I still cringe when I have to refer to the SyFy Channel in its written form, but I digress. I'm here to talk about Defiance, a fairly unique Shooter/MMO hybrid that also happens to be part of a trans-media effort to establish both a virtual world and a television show. SyFy tried something similar with Red Faction to limited success, so they're trying a little harder this time around, and have partnered with Trion Worlds to provide the game side of the bargain. It's the somewhat near future and an alien collective of refugees known as the Votan have come to Earth. Between the inevitable war breaking out and a terraforming disaster, things got pretty hairy. The debris from their Ark ships keep falling to earth, bringing scrap material (yay!) and Hellbugs (boo! ), and as an Ark Hunter it's your job to salvage the good stuff while taking out the hostiles. You'll cruise around a terraformed Bay Area on one of many types of vehicles (my hunter preferred her 2013 Dodge Challenger), and generally interact with everything with bullets or explosives. Defiance uses a class-less system. Your character can choose from one of four special abilities to start with (Cloaking/Damage Buff/Speed/Decoys) and you spend your EGO points to unlock perks for your loadouts. While the special abilities change how your character might approach a certain situation, in the end, most characters end up playing quite similarly. You can set up several loadouts, and specify whether or not they're for cooperative or competitive play and switch between them as needed, though I tended to find myself sticking with one playstyle. My biggest worry about Defiance was whether or not the shooting mechanics would feel solid. MMOs are usually built on autotargeting and command queues, with very few successful variations on the formula. Thankfully, hitting your targets and popping off headshots works much, much better than I expected. It's not going to replace your Halo and Call of Duty games, but it gets the job done. Impressive. 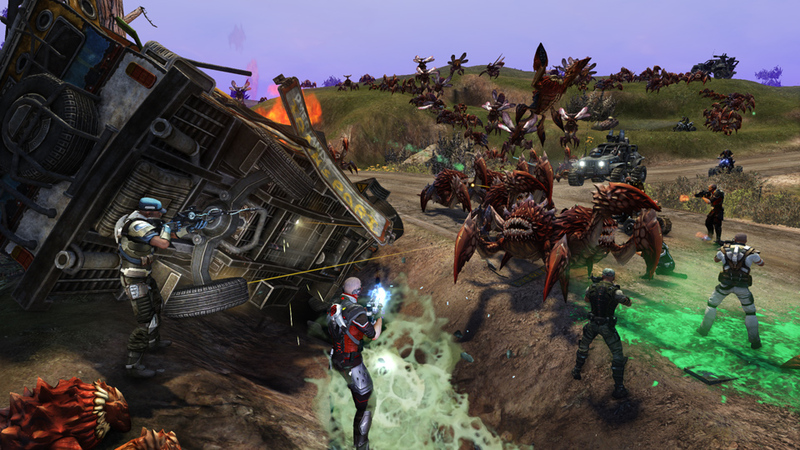 As an MMO, Defiance is inherently co-op. While you can group with up to four other players and quest to your heart's content, the public questing and Arkfall events let practically any number of players work together. Generally, any non-storyline quest in the game is open to anybody in the area who wishes to contribute, which is great. Taking a cue from recent MMOs such as Guild Wars 2, everybody who assists in a kill or a quest will get credit. I for one welcome this as an MMO trope. The main storyline missions are fairly well done - you'll get some dialogue or even a nice cutscene to set things up, then you'll participate in a scripted setpiece. They start out being fairly basic, but eventually lead to lengthy multi-part quests and investigations. The variation is nice and keeps you engaged. I also enjoyed that they're not as thinly spread out as "main" quest missions tend to be in other games. Conversely, the sidequest design in Defiance feels very cut and paste. Walk up to a sidequest marker and you'll receive some generic canned audio about getting mercenary work, and then proceed to walk into an area and click on 3-5 control points to win. Since they're all "public", you might drop in right as one of the quests is ending, which can be confusing the first few times it happens. They're a step up from "Kill X Monsters", but almost feel dropped in to fill a content void. Challenges also litter the world, and come in several varieties - Rampage, Hot Shot and Time Trials. Rampage and Hot Shot are combat challenges, while Time Trials have you hopping in your chosen vehicle and racing through a set course to earn medals. They're an interesting diversion, but I was usually eager to move the plot along rather than try and challenge the leaderboards.